Joeyyoga.com is a dubious search engine, considered to be a browser hijacker. As is the case with all hijackers, you install it yourself. And you do it unknowingly when you install freeware in Default settings. Even though it can enter your computer without your knowledge, it’s not a malicious computer virus. It will not directly harm your computer, however, it will cause you annoying redirects. 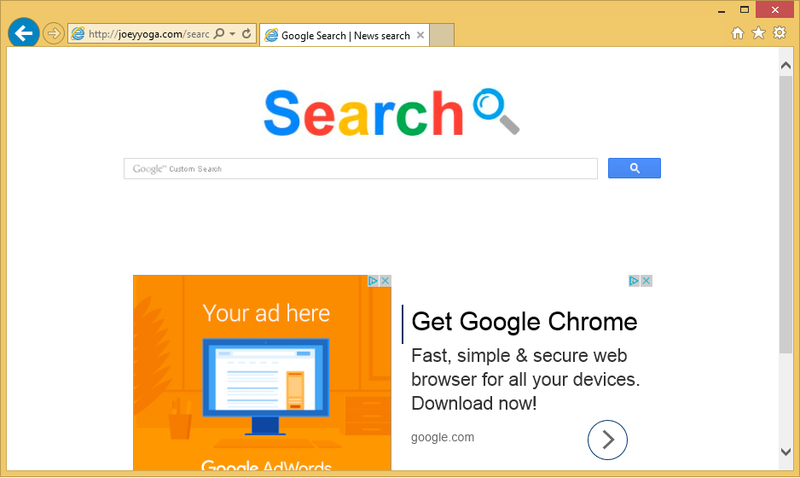 That is why browser hijackers exists, to redirect users to sponsored websites and earn website owners money this way. Additionally, browser hijackers are known to be able to redirect users to questionable websites, where they could accidentally download malware onto their computers. Malware is a much more serious issue than a mere browser hijacker, so you need to avoid it. We strongly suggest you remove Joeyyoga.com. Why should you delete Joeyyoga.com? Browser hijackers come in software bundles. They are attached to free software in a way that allows them to install along with the freeware and without you knowing. This has been done by unwanted items developers for years because users are still not aware of how to safely install freeware. If you use Default settings during freeware installation, you will end up installing all added items. To install freeware and skip all added items, you need to use Advanced or Custom settings. Those settings will allow you to deselect all additional items and you can proceed with the freeware installation. You might think this takes more time but it takes mere seconds. And it will save you time in the long run because you will not need to uninstall Joeyyoga.com or similar unneeded items. The first things you will notice if Joeyyoga.com installs onto your computer, is that your homepage, new tabs and search engine have been changed to Joeyyoga.com. The browser hijacker has made changes without your knowledge and you might struggle with restoring them, unless you first remove Joeyyoga.com from your computer. It doesn’t matter which browser you use, it can hijack Internet Explorer, Mozilla Firefox, Google Chrome and Safari. The search engine will insert a lot of sponsored links into the results so that it can redirect you to sponsored websites. This will make it difficult to find something relevant because you will have to go through countless useless results. We suggest you to be careful and avoid sponsored content because you cannot know where you will end up. You could even be redirected to a dangerous website and end up downloading malware onto your computer. Joeyyoga.com does not provide any useful features so we recommend you delete Joeyyoga.com. Automatic Joeyyoga.com removal is the quickest option. It will quickly locate and uninstall Joeyyoga.com and you will not have to do anything. If you do not have it, you can erase Joeyyoga.com manually. Instructions on how to eliminate Joeyyoga.com will be provided below.